187 labyrinths found. Showing 141-160. Sorted by country, state, city, then zip/postal code. 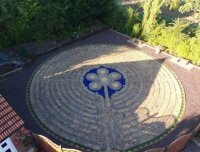 The grounds of the retreat house are always open and visitors are welcome to walk the labyrinth. Visitors to the house are also welcome, though access may be restricted during retreats. 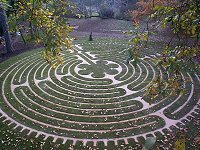 An exact copy of the Chartres labyrinth on sloping ground with views across the valley. Spa Park is on the corner of Park Street and Church Lane, just west of the city centre. A simple turf maze in the children's playground, created by the local Rotary Club, based on the design of the former turf labyrinth situated in Ripon, destroyed in 1827. Labyrinth at Wisdom Centre, Romsey, UK. Wisdom Centre Labyrinth most closely replicates the Santa Rosa Labyrinth a design based on the Medieval Manuscript Labyrinth. 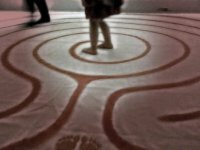 Our seven-circuit labyrinth is divided into four quadrants and holds a space on the fourth circuit called the "heart space" this area is not walked but serves as a sacred vessel for holding symbols of one's issues, needs or celebrations. Looking at the path, you will realize that this "heart space" is approached from all four directions, allowing one to hold one's symbols from several points of view. Set in the beautiful countryside about half a mile south of Ruddington, Rushcliffe Country Park is an ideal place to get away from it all. With a network of over 8 kilometres of footpaths, grassland, conservation and landscaped areas, the park is excellent for walking, jogging, cycling, spotting wildlife and exercising your dog. 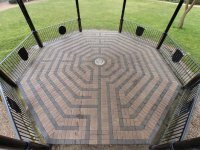 The labyrinth forms the floor of the bandstand at the rear of the gardens. 9-circuit octagonal design, with entrance and exit paths. Situated at the north east corner of Bridge End Garden, which is accessed from Castle Street or Bridge Street. Simply-connected hedge maze with a raised platform at the centre, and stone features. Finger labyrinth mounted on external gable wall of private house, adjoining public land. Please do not drive into Mill Lane which is a narrow cul-de-sac. There is plenty of parking nearby in this charming historic market town, where there are three other labyrinths and a maze to visit. Labyrinth is accessible at all times. Open every day between 9am and 4.30pm in winter and 7.30pm in summer. We meet at Saltaire Methodist Church on Saltaire Road. There is a car park on the east side of the church. We are a short walk from Saltaire train station, and the 662 and 760 buses pass close by (along the A650). Please enter by the ramp at the front of the church. We walk on the last Sunday of the month between 6pm and 8pm (please arrive by 7pm). We usually take a break in August and December - please check website. All the elements are incorporated in the design and water travels underground in copper piping replicating the pattern of the labyrinth. This water can be drunk and has been photographed by the Hado Life laboratories of Professor Emoto showing how the frozen crystalline form changes by passing water through the labyrinth. Admission throughout the year by appointment. This is in the garden of a house used as a location for Quiet Days and spirituality exploration. From the front it looks like an ordinary council house. Arrangements can be made to be open as requested. 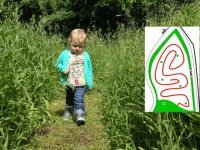 Sat 21st June 10am -1pm Labyrinth Workshop, includes indoor Labyrinth, outdoor walking Labyrinth around Shrewsbury (UK) and then creating one to take home. 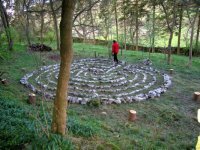 This is a canvas labyrinth, used to run Labyrinth Walking Meditations by myself, Su Barber, Mumbatime. I tend to run these at the turn of the year, the equinoxes and solstices. 54 8'7.51° Lat. ; 2 2'7.49° Long. The very first Westcliff Labyrinth! On various days throughout the year, various designs and styles of labyrinth will be appearing... you just have to keep your eyes open! 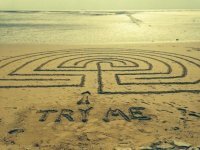 The Westcliff Labyrinth is a temporary outdoor labyrinth drawn on the beach, which comes and goes with the tide! The Westcliff Labyrinth differs each time, and may be classical, medieval, or contemporary!